We ship to all countries. Not all countries are possible in the courier option. In the courier option we do not offer south and middle Amerika and Russia. You can certainly send clothes and other items purchased abroad however just as when you arrive at any airport, do be aware the customs authority reserves the right to charge local duty and taxes on any imports of items purchased abroad (but customs would not know this if it is not in the original wrapping or if the tags are removed). If you have been tempted by cheap counterfeit goods abroad, these must not be included in your shipment, if your bag is found to contain counterfeit goods they will be removed and destroyed by customs, you may also face prosecution. Musical instruments such as guitars should be prepared for transit within the manufacturer’s guidelines. In the first instance this may include steps such as de-tensioning strings and providing additional support for areas such as a guitar’s neck within the case. You should also ensure the instrument fits snuggly within the case and take care to pad and protect any vulnerable areas. Once your instrument is secured within its hard case (soft gig bags are not appropriate), the case should then be placed inside a sturdy box with suitable packaging materials suspending the instrument case within the box. The packaging material is crucial as this will absorb the shock as your box slides down sorting chutes. Your musical instrument will travel on automated belts and slide down sorting chutes, the automated network cannot read labels such as ‘This way up’ or ‘Fragile’ and as such you must ensure your instrument is thoroughly packaged for this method of transport. Musical instrument cases are typically simply polystyrene covered with canvass or plastic, these cases are designed to carry your instrument, not to ship it. If you choose to send a musical instrument without placing it in a box, please be aware when a case slides down a sorting chute the case will provide little shock absorption and the case or instrument may be damaged and no claim for damage can be considered. If your instrument is sent packaged in any other way please ensure your specialist musical instrument or travel insurance has you fully covered. Non-perishable foodstuffs and small amounts of liquids such as olive oil (alcohol based and flammable liquids are not acceptable) can be sent on standard services within the EU. All liquid, paste and gel based foodstuffs are strictly prohibited on international express services. Electrical items can be sent using our service, however, require additional packaging when placed in a suitcase or a box. Laptops, TV’s, printers and all other electrical products are classed as ‘non-standard excess baggage’, and as such are sent at your discretion, these items are not covered by Excess Baggage Shipping and you should ensure you have sufficient home or travel insurance in place for your personal needs. If you choose to send any electrical items please bear in mind the retail packaging will not be sufficient protection for transit. Some items’ retail packaging may be a double walled box, for example this is typically how a flat screen TV is sold. However that retail box is not sufficient packaging for transit, that box will have travelled to the electrical store on a pallet wrapped with other boxes, a box that is sent with an international courier will move individually through the automated network on conveyor belts and sliding down chutes. In order to prepare your item for transit the retail box should be suspended inside a sturdy double walled shipping box or on a pallet. If you choose to send a laptop, it’s important the battery is not removed from the casing. International shipments are limited to one lithium battery per order. If sending to or from Australia, lithium batteries cannot be included. We are unable to accept bin liners and laundry bags on our service as they are not strong enough to withstand the rigors of transit and are likely to fail and spill the contents. In the same category are plastic storage boxes, such as those used under beds or in garages. In our experience, these are also too fragile and are likely to crack or fracture during transit. Yes, actually we do send more boxes than suitcases. We recommend only using double walled cardboard boxes secured with plenty of tape and correctly folded. Boxes must be secured by running tape across the folded flaps at the top and bottom, as well as in a loop around the box from back to front and from side to side. We also suggest running tape along the seams of boxes. Only taping across the folded flaps is not sufficient. Plastic boxes or single walled boxes such as crisp boxes are not acceptable. Make sure when you pack the box the goods are secured and do not ‘rattle’ inside the box. You can use towels, clothing, padding paper or bubble wrap to protect the goods inside the box. Aerosols (or any pressurized container), perfume, nail varnish (or any other flammable liquid), toner cartridges, tobacco, alcohol, money (including small change), drugs, medicines, fireworks, animals or their products and fresh food are always forbidden in air freight. Liquids, pastes and gels (excluding flammable ones e.g. nail varnish and perfume) such as shower gel, non-flammable makeup and toothpaste can be sent to European destinations. Please ensure there is no possibility of liquids leaking. Yes, we do offer storage after collection. We keep your goods in our warehouse in Belgium. You can send your luggage’s, suitcases and good quality boxes (double walled and not too big – you can procure with us these top quality boxes) – filled with your personal effects and household goods. We do not accept plastic bags or plastic boxes in a ‘loose’ (‘loose’ meaning unpalletized or uncrated) courier service. We also accept commercial goods. Based between Antwerp and Brussels we provide our export services in the BeNeLux region, northern part of France and western part of Germany. We import from worldwide locations. What are your size and weight allowances? What are the extra charges when I go over this weight and dimension? You can send an individual item of maximum 70 kg (total shipment can be heavier). Parcels heavier than 25 kg have a 80 euro surcharge. You can send items with a length of max. 220 cm. Parcels with a length longer than 120 cm have a 80 euro surcharge. 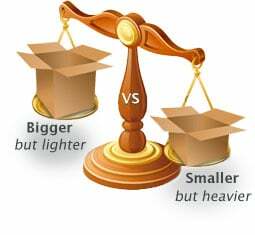 If you ship on a pallet take into account that the extra charges for overweight and overlength also apply. Since shipping on a pallet requires supplemental handling a surcharge of 100 euro is applied. You can send an individual item of maximum 70 kg. Parcels heavier than 25 kg have a 80 euro surcharge. Heavy items are placed on pallets. We ask you to book a few days in advance. If you have a specific collection date and time, or at the end of the month, you probably should book a bit sooner. We can even collect the next day, sometimes even the same day. Please request your quote through this online form. We will send you our best prices as soon as possible. How do I measure the parcel? How do I weigh the parcel? We require three dimensions: width (front to back), length (side to side), height (top to bottom) and the weight. Do take into account that filled boxes tend to bulge out, you need to add that in your dims. To weigh the parcel place the box onto a scale with the box not touching the ground. Yes we do offer an economy ‘loose’ courier service. With an economy service our staff will not do the collection at your residence. The courier (of the international courier service) will directly collect the boxes at your home. We will provide you with the labels after you provided us all the information, documentation and full payment. We do not feel that the economy service is the best option, certainly the price difference between an economy and our base service is only marginal. This economy option is only available to corporate customers or privates who have experience with this type of collection and service. Your shipment will depart after we receive payment of our invoice. From that moment it will take 3-7 days depending on destination country and customs. We recommend you secure your bag with a cable tie (where you would normally place a padlock), cable ties are tamper proof yet if a security scan flags your item and we ask your permission to open it, a cable tie can be cut away without damaging the bag. If you must lock your bag, please use a combination lock and not a padlock. If a bag is flagged by a scan or x-ray and requires inspection, customs authorities may break open your combination lock without contacting us. If you your bag includes a TSA lock we do not recommend setting it. We cannot replace broken locks which is why we recommend using a cable tie. Many customers will also wrap their bag in cling film and tape for protection. No, we will print the labels and attach them since we will collect the goods from your residence. Only in the economy service you need to print out your own labels. How should I prepare my suitcases or boxes for travel? As our service is door to door we recommend wrapping your suitcase with tape and cling film/plastic film. This will help protect your bag against scuffs and bumps as it travels through the automated network. Also some suitcases have an outside surface that prevent labels and stickers to attach to this. Certainly these suitcases need to be wrapped in plastic film. We can wrap the suitcase for you. For customs and security reasons please do not lock your bag, instead secure it with a cable tie or with a plastic wrap. If your suitcase has a pull handle please secure it in place with tape to ensure it does not slide out and become damaged whilst in transit. “Spinner” style wheels have become popular in recent years however in our experience while they offer mobility on the ground they are often not particularly sturdy, if using a spinner-style suitcase we recommend opting for one with recessed wheels. Boxes are welcome on the service but must be sturdy double walled cardboard boxes designed to hold the weight packed. Boxes should be secured by running tape across the folded flaps at the top and bottom, as well as in a loop around the box from back to front and from side to side. We also suggest running tape along the seams of boxes. Only taping across the folded flaps is not sufficient. Plastic boxes or single walled boxes such as crisp boxes are unfortunately not acceptable. DON’T OVER PACK SUITCASES OR STRAP MORE THAN ONE BAG OR BOX TOGETHER. 25 kg is already very heavy. While manufacturers may advertise their luggage or boxes can hold 30kgs or more, please take a moment to check if you are confident the zips and carry handles or cardboard will definitely hold the weight packed! Do not forget that the box, bag or suitcase will travel thru an automated sorting line during processing bags will travel on conveyor belts and slide down sorting chutes. If you send an over-packed box or bag which bursts open we cannot be held liable for any loss of contents. When sending boxes we recommend a sturdy double-walled box sealed with plenty of tape. If you strap more than one bag or box together and they become detached in transit only one piece will have your tracking information. So we recommend not to attach parcels together. In that case, try to contact us ASAP. If you are a student, you need to ensure you arrange your collection from a point within your university that our driver can access, drivers cannot access individual dorms but we can call ahead. If you’re unsure speak to your University they will be familiar with collections by couriers and may advise of a reception or post room that is used for collections within the campus. If sending from a porter’s lodge include this in the address. When you pay cash we will make the invoice upon collection. If you’re shipping used personal effects on a route that requires certain documentation to be provided, but do not have these documents, we will be unable to clear your shipment as used personal effects and, as such, duties or taxes may be assigned to the shipment by the customs authority in the destination country. Most of the shipments we send do not have any problems at customs. There are a number of reasons why a shipment may be ‘on hold’ in customs longer than anticipated. These range from missing or incomplete paperwork, customs needing to contact the receiver to confirm further details, the general volume of shipments being processed through customs or a shipment may require duties and taxes to be paid, in order for it to be released. If you believe your shipment has been in customs clearance longer than necessary, we should be contacted. We will either be able to advise immediately why the item is still ‘on hold’, or contact the relevant customs department, to identify and assist (where possible) the reason for the delay. They will of course contact you back with an update/resolution. Also for New Zealand you will need to self-custom clear the shipment. There are, at present, 14 customs offices in New Zealand (NZ) which can handle self-clearance requests. We recommend contacting NZ customs prior to shipping, to confirm any queries you may have, and to locate the nearest office in the event you wish to self-clear. Also for India it is possible that the consignee of the shipment need to present himself with the original passport, proving outgoing and incoming customs stamps in the original passport. Make sure you are in the country when your shipment arrives. We welcome our customers sending commercial shipments with us; however, it is not possible to clear these as we would ordinarily as a shipment of ‘Personal Effects’. All commercial shipments are subject to duties and taxes at the destination countries point of entry; therefore we would strongly recommend you contact the customs authority in the destination country to ensure you understand what duty or taxes may be applied and if you need import permits for these goods. We do not accept billing for duties and taxes to be paid for at a later date, therefore any duties raised by a customs authority will need to be settled directly between the consignee and the customs authority in question. On our most popular routes, such as those to the USA, Australia, New-Zealand we will submit the customs paperwork the moment your shipment departs our warehouse. This allows the shipment to be ‘pre-cleared’ whilst the item is still en-route to the destination country. This course of action is done in a bid to speed up the customs transit and reduce any possible customs delays. Some countries do not allow us to ‘pre-clear’, and will only begin the customs clearance process once an item has physically arrived in the country or when the consignee is in the country. Should your shipment be stopped due to missing or unreadable paperwork or because the shipment needs to be physically inspected by a customs agent, this can cause unforeseen delays. Customs authorities are governed by the local country and cannot be influenced by us or our courier partners. This value is for customs purposes and should reflect an estimated resale value for the contents of your bag (not a replacement value), for example a toothbrush would have no resale value and a used shirt may be valued at a few euros. If you send new or commercial items import duties and taxes may be due as standard. If you are unsure of the allowance for your destination please check with the customs authority. The information needed for duty free clearance varies country-by-country. In some instances, simply a packing list will suffice. In other circumstances a packing list and other personal details such as passport, flight ticket, work permit or visa may be required to satisfy customs. If your item is stopped by a customs authority and it is assessed as not complying with duty free entry, it will be the responsibility of the recipient to complete any clearance procedure, and pay any duties, taxes or charges. In some rare cases you may be required to present a passport at a local office, or if a customs authority has removed the item from your shipment you may also be required to pay the authority an additional delivery fee or to collect/destroy the item. Your collection must take place from an easily accessible location: the driver must be able to drive within 25m of the collection point. If this is not possible, it is likely the collection/delivery will fail. Best is to arrange an alternative address. No, you will not get a call prior to delivery. After 3 failed delivery attempts your item will begin processing to be returned to sender, associated costs will be billed to your account on which the order was placed. It is important you get in touch with us or even the service provider’s team at destination or to explore your options before your item is returned. You can book in a delivery with the on demand delivery service. We estimate the transit time of the shipment between 2-8 working days as from departure at our warehouse. 98% of the shipments get delivered within that frame. Sometimes it is possible that your shipment is delayed at customs or due to a factor beyond everyone’s control (weather, armed conflict, strike,…). We do not confirm delivery dates and do not reimburse you for a late delivery. It’s rare for a multi-item shipment to arrive at separate delivery dates/times, however this can happen in instances where a piece of luggage has been delayed whilst in transit, or where the consignment has too many pieces for one vehicle to deliver. In such cases, two vehicles may deliver larger consignments or any delayed piece(s) will arrive normally the following working day. If you have any queries as to where any pieces of luggage are, you can track the shipment with the tracking link you were send when we booked in the shipment. Yes, a new request to deliver can be made with the On Demand Delivery service. Please be mindful, the courier will only attempt delivery 3 times. When we handed over the shipment to the international courier service you received a message via email and you are informed about the date that delivery is expected to take place. The message contains a link to the ODD (On Demand Delivery) system, easily accessible via smartphone, tablet or pc. Please be advised that using On Demand Delivery service and requesting a forward delivery change could lead to a longer lead time of at least one additional working day. Certain delivery options may not be available due to the nature of the shipment or at the shipper’s request. As soon as your shipment is handed over to our service provider, you will receive a message via email and you are informed about the date that delivery is expected to take place. The message contains a link to the ODD (On Demand Delivery) system, easily accessible via smartphone, tablet or pc. Deliveries can take place anytime between 09:00 – 18:00 (local time). During certain times of the year (during periods of increased volumes of shipments) for example Summer or Christmas, deliveries may take place outside of this window. Unfortunately, we are unable to advise of a more accurate delivery time. You can check the tracking details of the shipment and request a certain delivery window. No you will not receive a telephone call. The transport time as from departure is 2-10 working days as from departure at our warehouse depending if the destination address is inside or outside the European Union and how fast the shipment goes thru customs. If you are a student, you need to ensure you arrange your delivery at your university please note that that the drivers cannot access individual dorms or call ahead with a delivery. If you’re unsure speak to your University they will be familiar with deliveries by couriers and may advise of a reception or post room that is used for deliveries within the campus. If delivering at a porter’s lodge include this in the address. Certainly you will need to put your name on the door bell or entrance at the building. If you are a student, you need to ensure you arrange your delivery at your university please note that that the drivers cannot access individual dorms or call ahead for delivery. If you’re unsure speak to your University they will be familiar with deliveries by couriers and may advise of a reception or post room that is used for deliveries within the campus. If delivering at a porter’s lodge include this in the address.